Event: Create 2 double page scrapbook layouts. Janice is keen to print off her photos from her computer diskdrives and camera/phone and actually document them in pretty scrapbook layouts. She wants you to join her in this mission! We've all got hundreds if not thousands of digital photos. Let's look at them off the screen and share them with others. We are crafters so let's incorporate pretty papers, embellishments and die cuts designs, and then give our layouts titles so we know 'who', 'when', 'where', 'what' and 'why'. You'll be surprised at how quickly you'll forget dates and places. 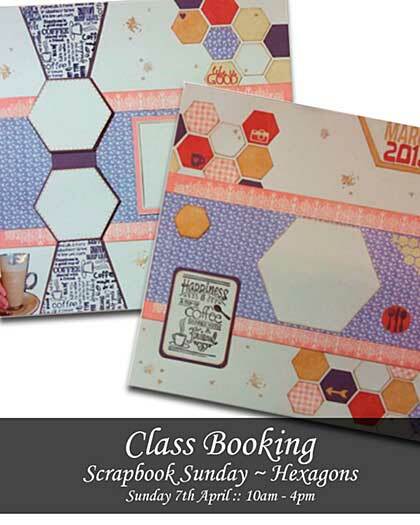 Theme: Hexagons - Scrapbook Layouts incorporating the very popular shape - hexagons. Picture shows just one of the two double page layout projects you'll be creating on the day.